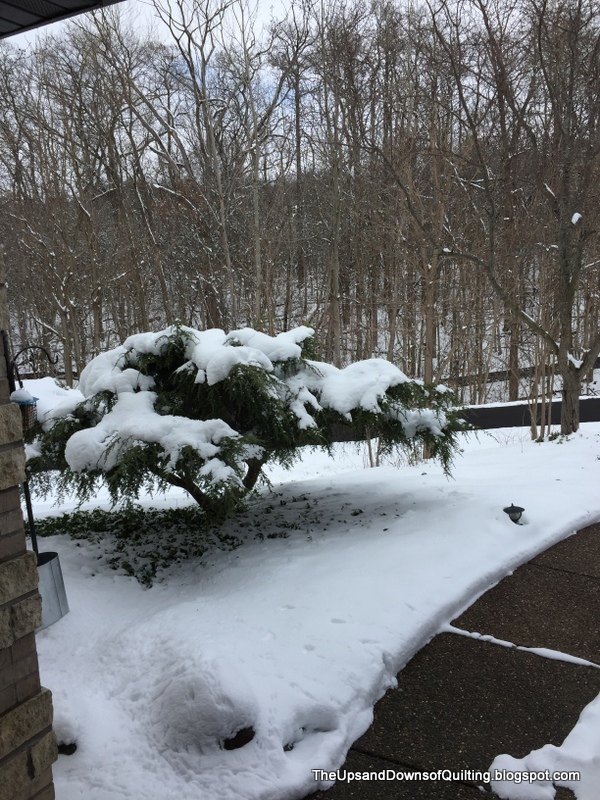 We have received a significant amount of snow in the last 18 hours. 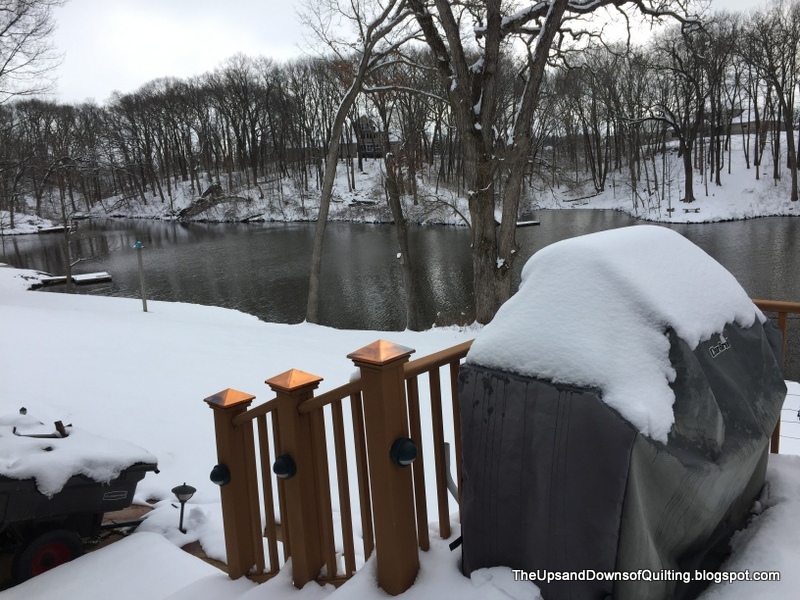 The start of 2017 has been dry and February was down right warm. We ended up with about 5" of snow since last night. It doesn't look like it will last too long. The lake is looking cold and frigid. Momma goose has been working on her nest, but she isn't sitting yet, good thing. The geese are just a little out of their element. They were hanging out by the road and look funny walking through the snow. One of them has ice hanging from the beak. We will see what this weather does for DH's trip to DC. He was scheduled to leave this morning....his flight was canceled. He has another flight tomorrow morning. I think he will drive to Chicago today and drive home tomorrow. No one will cancel anything yet. Here is the design wall this morning. The center applique needs to be trimmed down yet. I think some peachy leaf "things"might still be added to the center area. The rest is together. 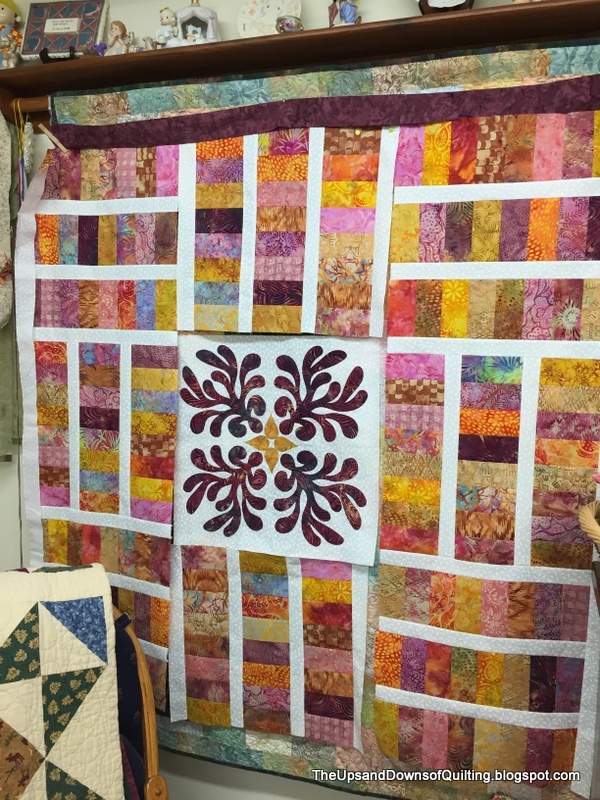 The body of the quilt has an inner border of white and you can see the dark burgundy going for the outer border. The outer green is actually the quilt hanging in the sewing room acting as a design wall at the moment. That is not part of the quilt. 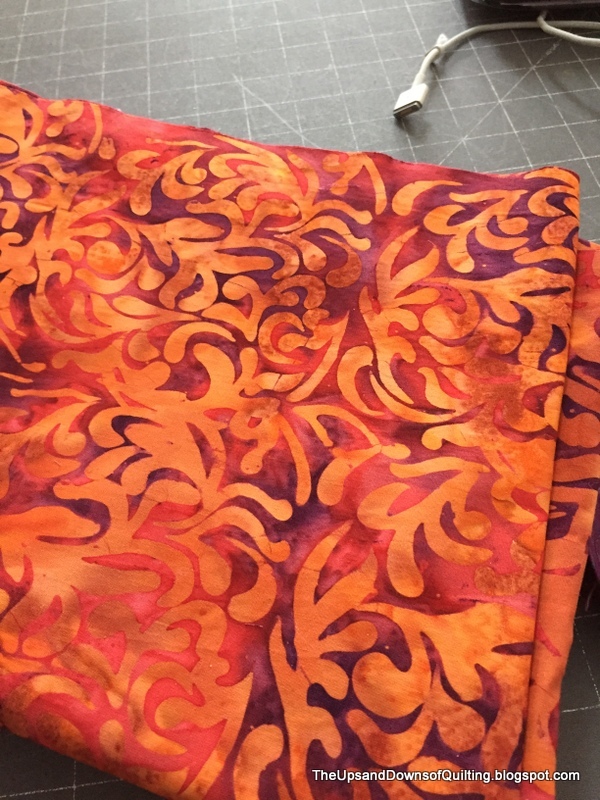 The fabric below is the outer border. 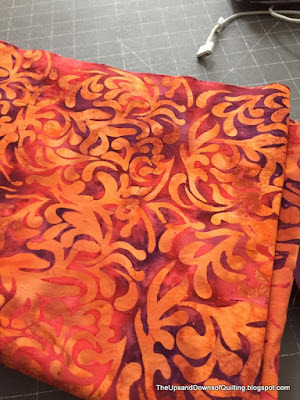 All of the fabric above was found in the sew room....the print below was a visit to the LQS on Saturday. It has been washed and cut. The binding is done......hopefully it will make it to the machine Tuesday or Wednesday. MJJR has an indoor track meet about 1hour away. Lola and I are heading off to watch. This is the first year MJJR has gone out for track. She caught her spikes on her first race....tore all the skin off her hip and forearm. Needed to spot treat the jersey. Hopefully tonight will be less eventful. She didn't wear her spikes after her spill last week and she has yet to practice in them due to weather conditions. Maybe she can work on it before her races today. 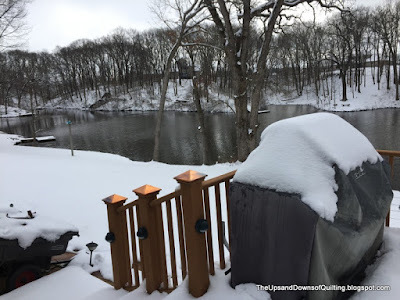 Linking up the Judy L. and Oh Scrap! Life has been busy here in the Midwest. Lots of sewing. DH has done much traveling for work. Our life really needs to be flexible. Not to say it is bad....Life is GOOD, but the big things in life right now seem up in the air. What is UP in the air....DH job (has settled since December), where is Lola living in 2 months (not where she currently does, graduates college), MJJR will not be living here in August (off to college) just to name a couple of the big ones. DH has done some major traveling in 2017-Atlanta, Chicago, DC, and Capetown, South Africa. I am holding down the fort. Here in a couple weeks DH begins the busy season. The "girls" are both graduating, college and high school, one week apart! Family is driving 4 hours for Lola's graduation, then back home, just to drive 5 1/2 hours to watch MJJR graduate the following weekend. Lola's move is in there. Baccalaureate ceremony is just 1 day after Lola's ceremony. So with some graduations, come some quilts for the graduates. Here is the latest graduate finish. It is going to a basketball player that is so kind and precious! 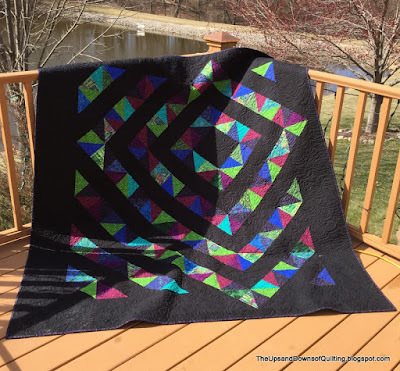 This is a Charm square friendly quilt by Tamarack Shack, Four Patch Charm. This link has a little tutorial. Kathy also shows where her inspiration came from. I really enjoy this blog. Tamarack Shack is located on the shores of Schist Lake, in Northern Manitoba. 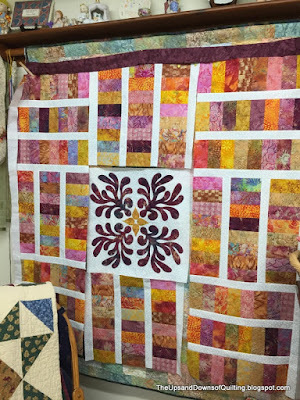 Kathy is a longarm quilter. You get to see many great quilts along with beautiful scenery. Most days I am happy to look at her frozen lake vs. mine. You can see the water behind this quilt. The sugar maple on the right is just starting to bud out. If your eyes cannot see it, my allergies will confirm it. The next project is started....a repeat of an earlier quilt. The Caribbean Blue Sea now lives in the Chicago area with our great niece (not a 2013 grad as planned, the recipient decided not to come to the graduation party-her loss). A replica is now going to show off the applique for a presentation in July. This time pink/rose/peaches. Do you think it might get a "Design Wall Monday"??? Check out others work at Crazy Mom Quilts.